We're all in the Delta Quadrant! Believe it or not, Star Trek Online's been around for four whole years now, and on January 30th, they're opening their 4-Year Anniversary event to celebrate. To get players old and new hyped for that, the developers at Cryptic have set phasers to "Infodump". The party starts with a literal party, hosted by the omnipotent being (and convenient source of MMO silliness) Q, where you'll play minigames and take on daily missions for free loot and tokens to trade in towards the grand prize, a free "Dyson Science Destroyer". That kind of name sounds like a ship that burns textbooks about evolution, but it's actually a ship that can transform between two modes with different play styles and powers. More narrative-focused players can also undertake a new story quest, titled "A Step Between Stars", which features voiceover work by actor Tim Russ, reprising his role as Tuvok from Star Trek: Voyager. That episode also rewards tokens towards the Destroyer. In keeping with the Delta Quadrant focus of recent updates, Cryptic have also debuted a new random-loot lockbox containing prizes that include playable ships used by the Hirogen hunters, hostile aliens from Voyager best known for becoming Nazi sympathizers and having faces that look like your fingers after you've spent too long in the bathtub. 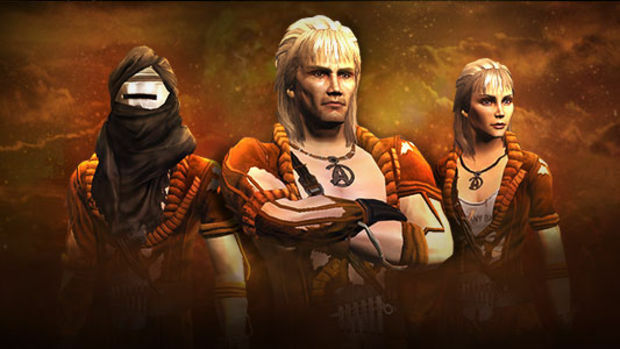 Lastly, players who log in to the game using Perfect World's ARC program (a Steam/Uplay-like store/launcher) will net a free bare-chested outfit modeled after Khan - the original Kahn from Star Trek II: The Wrath of Khan, played by Ricardo Montalban's pecs. That's a lot of stuff they're handing out, and if you're interested in getting your free-to-play Trek on, there are more details at the official site.